The Somerset Patriots (37-28, 87-48) defeated the York Revolution (38-28, 62-74) 5-4 Thursday evening at Santander Stadium. With the victory coupled with Long Island’s loss to Lancaster, Somerset clinched the Second Half Liberty Division Title. In the top of the first inning first baseman Matt Fields fisted a RBI single to give Somerset a 1-0 advantage. York took a 2-1 lead in the bottom of the third inning as third baseman Wilson Valdez recorded a RBI ground out and first baseman Andres Perez sliced a RBI single. Catcher James Skelton spanked a two RBI double in the top of the fourth inning to give the Patriots a 3-2 lead. Second baseman Greg Hopkins hammered a home run (12) in the top of the sixth inning to expand the Somerset lead to 4-2. 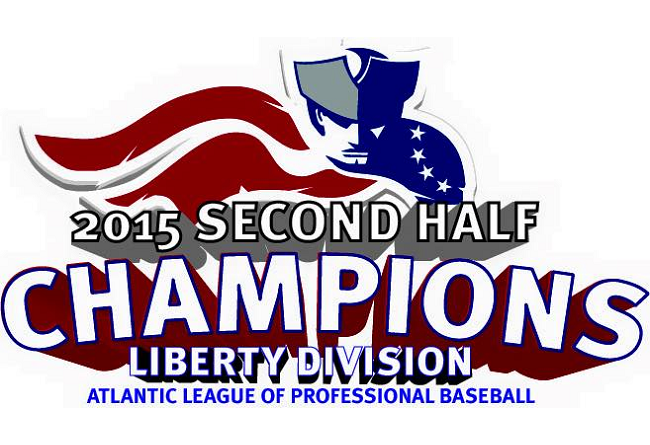 The Patriots retook the lead in the top of the eighth inning as Fields mashed a home run (5) to make the contest 5-4. Daniel Sattler earned the win (8-2) in relief. Ron Schreurs suffered the loss (4-1) in relief. Jon Hunton notched his 32nd save. The 2015 Somerset Patriots season presented by Ford will continue on the road until the Somerset Patriots return to TD Bank Ballpark for Game Three of the First Round Playoff Series on Friday, September 25th at 7:05 p.m. For tickets, call 908-252-0700 or visit www.somersetpatriots.com.